Hello dears! Cate and Julian Rosefeldt were in LA last week for the first public conversation about Manifesto. We have some pictures and extracts from the panel, thanks to the LA Times. If, given the occasion, you want more infos on the art project, check the right sidebar to follow the exhibition tour and visit the director’s site. Enjoy! More than a dozen Cate Blanchetts have shown up for our interview today. One, in a crisp blazer and stick-straight hair, is all business; another, wearing a draped turban and dark plum lipstick, is downright demanding; yet another, in a soft floral blouse and glasses, is contemplative, pious-seeming; a dirty, unkempt version unfurls with rage. These vastly different Blanchetts are part of German video artist Julian Rosefeldt’s multi-channel film installation, “Manifesto” (2015), which opened at Hauser & Wirth on Saturday. Blanchett embodies 13 different characters, including a feral-looking homeless man, a Russian choreographer, a television news anchor, a lonely puppeteer and a beleaguered trash incineration plant worker. All of them recite snippets from the manifestoes of artists, activists, poets, performers, filmmakers and intellectuals throughout the 19th, 20th and 21st centuries in unrelated vignettes on separate screens in the gallery. Suddenly, a 14th Blanchett emerges — and for a moment, she is speechless. The actress, in a hot pink blazer and jeans, steps gingerly into the pitch-black gallery, blinking as her eyes adjust to the darkness. She’s seeing this incarnation of the installation — its West Coast debut — for the first time and surveys the cavernous space with Rosefeldt as if bewildered at first, or possibly overwhelmed by the drama and potency of the artwork. Her disorientation is understandable: The glowing film screens hang from the ceiling in the darkness, as if floating midair, or are mounted to separate walls. The visuals are lush and textured; the blaring audio, as all the characters prattle on at once, is cacophonous, a disconcerting jumble of disparate declarations, diatribes and calls to action. “Wow,” Blanchett says, finally. “This is so … intense.” Sparks fly from a lighted fuse cord on one screen; her manifestation of a hunched homeless man hobbles across a foggy, gray field on another; her severe choreographer hollers instructions at showgirl dancers onstage on another screen, the schlop-schlop sound of their feet rising in volume with hers. 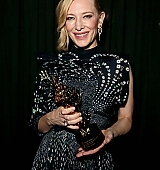 As Blanchett moves among these splintered selves, her amazement simmers into satisfaction of a job well done. Then, Blanchett tosses her head back and laughs, nostalgically, pointing to a nearby screen. “Remember that? We were losing the light,” she says to Rosefeldt, of a graveside eulogy scene at dusk. They exchange knowing chuckles, as if college roommates sharing road trip secrets. “Manifesto,” is a joint labor of love for Blanchett and Rosefeldt. The two met in 2010 in an art gallery in Berlin and vowed to one day work together. Rosefeldt approached Blanchett about the project three years later. He had been reading Futurist manifestoes by poet and choreographer Valentine de Saint-Point, which he’d quoted in his film “Deep Gold.” Sensing a resurgence in manifesto writing, Rosefeldt says, he began seeking out and reading other artists’ declarations going back in time. But the world was a very different place five years ago, when Rosefeldt first conceived of the work. It was different even in 2015, when the installation debuted at the Australian Centre for the Moving Image in Melbourne, and when the linear movie version premiered at the Sundance Film Festival in 2017. The individual manifestoes quoted in the work may be timeless in their urgent desire to make the world a better place through art, but the work as a whole has new relevance, set against our current sociopolitical landscape, Rosefeldt says. “I believe that this specific time we’re living in almost calls for manifestoes again,” he says, later adding that the art installation itself is not meant to be a manifesto — even though it’s often perceived by audiences as such. Each of the 13 vignettes in the work is a “text collage” of sorts, in which Rosefeldt stitched together lines from the writings of individual artists such as Claes Oldenburg, Sol LeWitt, Yvonne Rainer and Jim Jarmusch and groups including Surrealists, Situationists, Futurists and Dadaists. The scenes playing out on-screen — in which Blanchett delivers the manifesto lines to other characters or directly into the camera — aren’t necessarily related to the words being spoken. But the disconnect, Rosefeldt says, may force the viewer to think harder, pay closer attention. In one scene representing filmmaking manifestoes, a schoolteacher strolls from desk to desk, handing out test booklets to 8- and 9-year-old children. “Nothing is original,” she instructs them, quoting Jarmusch. In another vignette representing conceptual art and Minimalism, Blanchett’s staccato-sounding, perfectly erect news anchor says, deadpan into the camera, “All current art is fake,” a line from appropriation artist Elaine Sturtevant. Blanchett’s mousey homemaker, in a vignette representing Pop Art and featuring Oldenburg’s 1961 “I Am for an Art” manifesto, calmly sets the dining table before leading her family in prayer. “I am for an art that is political-erotical-mystical,” she begins, hands clasped and head down. Blanchett’s tattooed, rocker chick reclines on a couch, post-party, in a vignette representing Stridentism and Creationism. “Ideas often run off the rails,” she says, quoting Manuel Maples Arce. Such a heady project, meant to be viewed in art galleries, could have been a risky endeavor for an Oscar-winning actress. But Blanchett scoffs at that idea. “I don’t see the point in doing something if you’re not risking falling on your face,” she says. 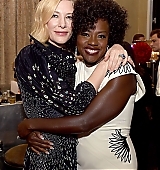 So Blanchett and Rosefeldt dived right in. The two met for one long afternoon in New York to develop the material, whittling down a list of 50 or 60 characters and vignette possibilities. The work was shot in just 12 days in Berlin in 2014, with Blanchett there for 11. It was a frenzied, fast-paced, “kamikaze-style” shoot, as Rosefeldt describes it, in which they moved quickly from location to location, often shooting in one take, and there was little — if no — time for rehearsals. “Each of these texts is like a theater monologue that you’d normally rehearse for weeks. 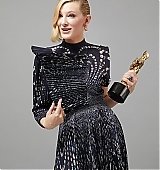 And Cate did it, like, ‘snap,’ without really preparing,” Rosefeldt says. Instead, every evening after shooting, Blanchett recorded the text for the next day’s vignette, and she listened to it in her trailer each morning while undergoing an hours-long process of physical transformation. As makeup artist Morag Ross, hair artist Massimo Gattabrusi and costume designer Bina Daigeler applied wigs, fake teeth and padded body parts, Blanchett fine-tuned her accents and physical gestures. “It was a much more external process. I had to decide [in the trailer]: ‘How about this character talks like that?’” she says in a deep, gravelly sounding voice. “Or, ‘What about the character talks like this?’” she coos in an elegant, lady-like manner. The chaotic pace of filmmaking worked, Rosefeldt says. “Just jumping into the cold water, just doing it, was very good for this project, because it created a certain freshness to the text,” he adds. 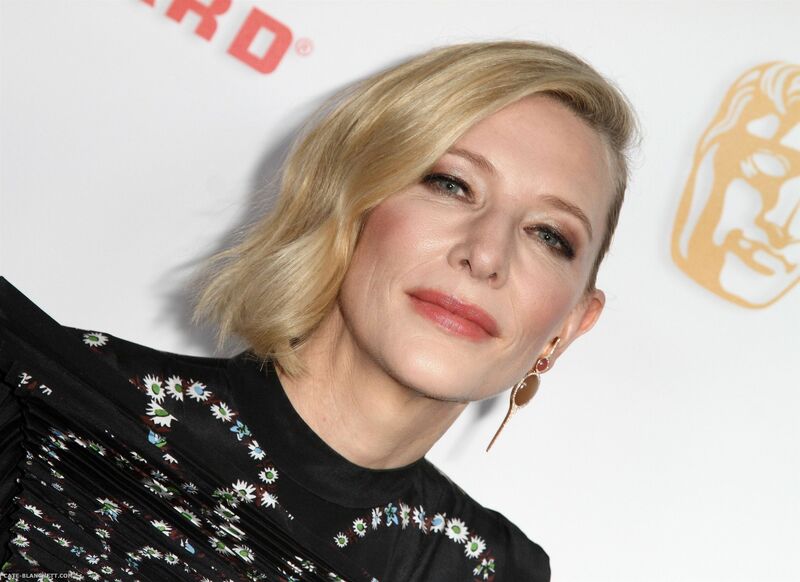 If she had to choose a favorite character, it would be the dual roles of in-studio news anchor and reporter in the rain, Blanchett says. Synchronizing the sound between the vignettes — each 10½ minutes long and playing on a loop — was akin to conducting an orchestra, Rosefeldt says. Even where the screens themselves are placed inside the gallery is strategic, audio-wise — one room is quieter, the other more thunderous. One factor that binds most of the manifestoes is that they were written when the authors were young. They share a youthful bluster and a rebellious spirit. This is especially evident at the end of each loop, when the sound is most synchronized. The characters all speak at once, in rapid monotone, as if the manifestoes are in dialogue with one another. The collective volume steadily rises until little is discernible. It’s at once passionate, intriguing and disconcerting. That’s the point, Blanchett says. Ultimately, the work explores the universal role that artists play in our society. And it’s not a passive one. “The role of the artist, it’s an ancient role where it has to be social propagation and social commentary,” she says. Good evening fellow Blanchetters, we are alive and well, just really, really, really busy. The site will be updated at a slower pace until we find a new co-web, but I’ll be updated, don not fear. We have collected almost 300 new pictures from the Rome Film Festiva and the Britannia Awards, including new outtakes from the photoshoot. Plus 15 minutes from The House with a clock in its walls Press Conference in Rome. Enjoy! Today we are bringing more videos from “The House with a Clock in Its Walls” premiere at the Rome Film Festival from last friday. Enjoy! 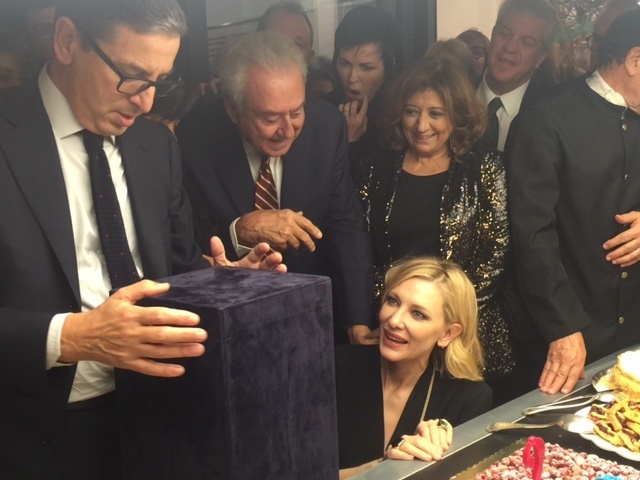 Cate attented four events during the 13th Rome Film Festival. Here are some new content related to this visit to Rome. Enjoy!!! 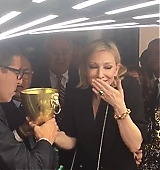 A margine dei suoi impegni per la presentazione de Il mistero della casa del tempo, la due volte premio Oscar Cate Blanchett ha partecipato a un incontro ravvicinato con il pubblico di RomaFF13. Il primo film di cui ha parlato Cate Blanchett è stato Il curioso caso di Benjamin Button (David Fincher, 2008). Mi sento romantica, soprattutto stasera. Ho accettato il film perché sono appassionata di tanti suoi elementi, come lo sceneggiatore Tim Roth, il regista David Fincher e Brad Pitt. Brad era così orrendo che è stato davvero difficile fingere di provare qualcosa per lui (ride, ndr)!. Il mio personaggio e le immagini mi hanno colpita, soprattutto l’ultima scena, con Daisy che guarda morire Benjamin, ormai diventato un infante. Tutte le madri sanno cosa si prova durante quella scena, perché pensano che prima o poi il figlio morirà e loro moriranno. Come ha detto Thomas Stearns Eliot, in my end is my beginning (nella mia fine è il mio principio), questo è il senso. Durante le attività stampa di Carol, mi sono sorpresa nel ricevere continuamente domande sulla mia sessualità, mentre per altri film non mi avevano mai fatto domande, per esempio, sulle mie capacità psichiche. In me ha suscitato una profonda sorpresa il fatto che il mio genere sessuale fosse improvvisamente diventato un argomento di cui discutere. Interpretare un ruolo secondo me significa creare un punto di vista universale su un personaggio, per cui il mio genere per me non è mai stato un problema, e non lo sarà finché non mi chiuderà una porta. Ci aspettiamo sempre di trovare affinità col personaggio, mentre per me la recitazione è antropologica, perché mi connetto con persone diverse da me e di epoche storiche diverse. Il grande piacere per me è capire cosa muove le persone, cosa le motiva. Carol per me è stato come un parto d’amore. Avevo letto al liceo il romanzo, ma alcuni anni fa il progetto era molto più difficile, essendo incentrato su due donne lesbiche che non lo nascondevano negli anni ’50, però per fortuna da allora le cose sono cambiate. È stato comunque molto faticoso trovare produttori, ma queste difficoltà sono state un ulteriore incentivo per farlo. Quando ho iniziato a lavorare non mi sarei mai aspettata di arrivare al cinema. Mi dicevano che avevo 25 anni e che mi dovevo sbrigare perché stavo diventando vecchia. Per fortuna, le cose non funzionano più così. Ho fatto 2 film con la Fox, questo con Levinson e uno con Isabelle Huppert, che sarà su questo palco domani. Penso sia utile passare dal cinema al teatro, perché il teatro ti dà una percezione del pubblico. Uno aiuta l’altro. Il cinema mi ha invece portata a valutare le possibilità delle grandi inquadrature e dei primi piani. Se mi puntassero una pistola alla testa e mi costringessero a scegliere fra i due probabilmente sceglierei il teatro, perché c’è un rapporto visibile col tuo pubblico e perché è un lavoro di squadra. Nei film, c’è un aspetto letterale, c’è un lavoro di narrativa sul personaggio che offre grande elasticità. Se a teatro vedi una schifezza non ci torni più, mentre al cinema ci vai lo stesso. A teatro però il pubblico è molto più coinvolto e ogni sera è un’esperienza diversa. Il film è un oggetto più compiuto in sé. Judi è fantastica, e quando lavori con attrici di questo calibro il tuo lavoro acquista la qualità dell’altra persona. Quando fai un film che è tratto da un romanzo, non sempre la fedeltà al testo originale aiuta. La scena della lite, per esempio, l’abbiamo dovuta rigirare, e Judi aveva dietro di se una specie di tartaruga per darmi margine per spingerla. Lo sceneggiatore era sempre con noi, tutto è diventato molto fluido e provavamo e riprovavamo le battute. Vi racconto un aneddoto emblematico: a Judi piace molto lavorare a maglia; ha preparato una fodera per il cuscino per il regista Richard Eyre, e ci ha scritto sopra una sfilza di “fanculo”. L’idea di partenza per il film era quella di un’opera teatrale. Quando qualcuno ti fa una proposta così folle, devi assolutamente dire di sì. Solo pochi potrebbero rappresentare un personaggio in 6 parti con 6 attori diversi, ma tutti noi eravamo in questo viaggio e volevamo sapere dove ci avrebbe portato. Io stavo girando Elizabeth: The Golden Age, e se lo vedete noterete che continuavo a perdere peso per tutto il film, perché mi stavo preparando al ruolo che avrei dovuto fare. Adoro Bob Dylan, mentre lo studiavo ero totalmente presa da lui, ed è stato l’unica volta che mio marito è stato geloso. Non so se ha mai visto il film, io comunque non ci ho mai parlato. Penso che come avviene per molti registi sceneggiatori, la regia avviene attraverso il testo, per cui una grande sceneggiatura o testo teatrale contengono già molte informazioni, e a quel punto si tratta solo di fare gioco di squadra. Liv Ullmann era venuta in Australia per dirigere una versione teatrale di Un tram che si chiama Desiderio, in cui io avevo interpretato la protagonista Blanche. In seguito l’abbiamo portato in America, e credevo che Woody l’avesse visto, considerando le somiglianze fra le due opere. Quando gliel’ho chiesto, lui mi ha detto che non l’aveva visto e non voleva sentire parlare di Un tram che si chiama Desiderio. Il mio corpo conservava però qualcosa di quel ruolo e questo mi ha aiutata molto. Nel cinema non funziona molto l’eccesso di pensiero e c’è chi dice che le prove servono solo per riportare l’attore indietro all’atmosfera iniziale, che era già quella ottimale. Sono cresciuta divorando i film con Katharine Hepburn e ammirando la strada che lei ha aperto alle donne al cinema. Stavo lavorando a The Missing di Ron Howard, e il mio agente mi ha chiamata dicendo che Martin Scorsese mi aveva cercata e mi avrebbe richiamata dopo mezz’ora. Io stavo accanto al telefono tremando, come se avessi il Parkinson. Non ricordo niente della chiamata, so solo di avere detto sì, entusiasta di lavorare con lui. Solo quando ho realizzato la difficoltà della parte mi sono spaventata. Consiglio caldamente a chi non avesse visto questo film di vederlo, perché è straordinario. È la storia di un’attrice di Broadway che vede arrivare il suo tramonto. La recitazione e il ruolo di Gena Rowlands sono straordinari, perché riesce a entrare in quello spazio fra il ruolo e la persona che lo interpreta; ha una capacità straordinaria di creare l’emozione di una persona che si distrugge mentre crea un personaggio. È stata grande fonte di ispirazione per me. 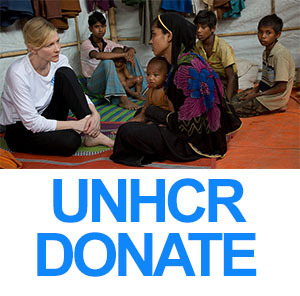 In chiusura di incontro, Cate Blanchett si è prestata a un ultimo veloce gioco, ovvero associare una parola a 3 grandi registi con cui ha lavorato. A Martin Scorsese ha associato la parola ilare, mentre per Woody Allen ha scelto enigma. Steven Spielberg invece? La riposta è stata vorace.